After plenty of teasers last month, Sony continues to spill the details of the new pair tablets that it will release next month and early next year. The Sony S1 Playstation Tablet, named as Tablet S, will be due September and will serve as Sony’s main entry to the existing tablet wars. While earlier reports have cited that both tablets will run in Honeycomb 3.2, Tablet S will be fitting in at 9.4-inch with 1280x768 pixel resolution; and an eye towards upgrading to Ice Cream Sandwich. The keypoints of this device is that it has a distinct feature of controlling home devices, via network or integrated blaster. 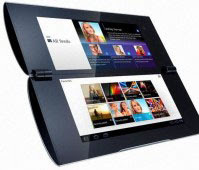 It also has DLNA connectivity to Sony and other devices. Cameras coming in at 0.3MP and 5MP. The basic features like wireless keyboard, dock-up set-up and micro-USB to USB host dongle are well defined. And its “Trublack” technology supports better screen register color and fewer glares. Lastly, all the Sony’s playstation certified gaming, music and movies are all in the cache. When opened, S2 reveals a twin 5.5-inch displays. This was planned to be released next year, and the main hardware is a dual screen clampshell. It’ll weigh for around 370 grams, (less than iPad 2’s 601 grams), 4GB storage, 2GB SD Card, 0.3 MP and its 4G enabled. Both tablets will have NVIDIA Tegra 2 processors.